Every time I've taken the train to Canterbury, I've noticed Rochester Castle towering over the town and the river Medway. Earlier this year, I finally made the trip to see it. Today, little of the interior survives, although you can see arches and the internal well, but there are still impressive views from the top. Look out for Satis House: it got its name because when Elizabeth I visited, she passed judgement on the hospitality in one word, "satis" (enough). Charles Dickens, a resident of the town, borrowed the name for Miss Havisham's home in Great Expectations. (Confusingly, he modelled the actual building on nearby Restoration House). After climbing all those stairs, you can reward yourself with tea at the Cathedral's tea rooms. Rochester Cathedral also dates back to Norman times, and is conveniently located next to the castle. *Well, there is doubt whether he really died of a eating too many peaches - it could have been poisoned plums, poisoned beer, or dysentery. The traditional image of Florence Nightingale is 'the lady with the lamp', a gentle and feminine figure tending the wounded of the Crimean War. However, while her role in the military hospital of Scutari made her famous, it also gave a misleading picture of her as an embodiment of conventional Victorian feminine virtues. In fact, Nightingale was a forceful and determined woman, a pioneer of nursing education and a committed feminist. She had to defy her family in order to become a nurse, and fought again to make nursing a respectable profession. Her aims were much wider than simply ministering to individuals: she sought to reform the way that nursing was practised. 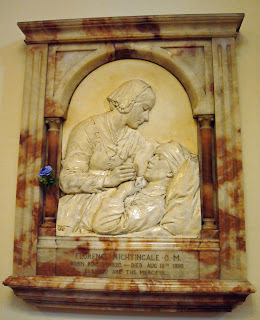 The Nightingale Training School for Nurses at St Thomas' Hospital was established by her and she was involved in it for over 30 years. She also advised the government on nursing reforms and public health. Nightingale based her work on careful analysis of statistics: she was the first woman to be elected a fellow of the Statistical Society. If we [women] have no food for the body, how we do cry out, how all the world hears of it, how all the newspapers talk of it, with a paragraph headed in great capital letters, DEATH FROM STARVATION! But suppose one were to put a paragraph in the “Times”, Death of Thought from Starvation or Death of Moral Activity from Starvation, how people would stare, how they would laugh and wonder! One would think we had no heads or hearts, by the indifference of the public towards them. Our bodies are the only things of any consequence. Nightingale was, then, a much more complex figure than her public image suggests. All these aspects of her life are fully explored in the Florence Nightingale Museum at St Thomas' Hospital, London. 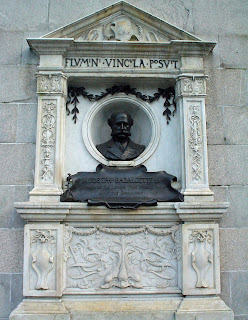 Tucked away near Embankment is this monument to Joseph Bazalgette. In recent years his name has once again started to become familiar to Londoners (thanks in large part to Stephen Halliday and his book The Great Stink of London). 150 years ago, the River Thames was a major trading route, a source of drinking water ... and an open sewer. As the city grew, the old system of 'night-soil men' emptying privies and selling on the solids as fertiliser was no longer keeping up with the volume of waste. Meanwhile, the popularity of the flush toilet further increased the volume, cess-pits overflowed, and the noxious stuff made its way into sewers designed only for rainwater. The result: sooner or later, most of this sewage flowed into the Thames, without any treatment before it got there. Add in a hot summer, and the stench became absolutely unbearable. Typhoid and cholera hadn't prompted the authorities into effective action, but when the smell overwhelmed the House of Commons, something was finally done. Bazalgette was put in charge of solving the problem, and created the sewage system we still use today. Instead of flowing into the Thames, waste is caught by two intercepting sewers so that it can be treated and taken clear of the city. The scale of the project is unbelievable, with over 500 miles of main and intercepting sewers. However, Bazalgette not only cleaned up the city; he also changed its shape. The land of the Victoria and Albert Embankments was reclaimed from the Thames to hold the intercepting sewers and narrow the river. A narrower riverbed meant a faster flow of water, so that stinking mud did not collect. The embankments also hold pipes, Underground tunnels on the north bank, and main roads. Bazalgette may have made London bearable once more, saved uncountable lives, and even reshaped the Thames, but that's not the limit of his achievements! He designed Battersea Bridge, Putney Bridge and Hammersmith Bridge, set up the Woolwich Free Ferry, and laid out major London streets including Charing Cross Road, Shaftesbury Avenue and Northumberland Avenue. Given all this, his memorial's motto 'flumini vincula posuit' (roughly, 'he placed the river in chains') seems not a boast but an understatement. 1. Euston (or alternatively Euston Square). 3. Sir Hans Sloane, physician and botanist whose collection was the basis of the British Museum. 6. Angel - it was named after a former coaching inn. 7. The Earl of Oxford. One of my favourite London books is a small volume called 'What's in a name?' by Cyril M Harris. Its simple but inspired concept is to give the origins of every underground and Docklands Light Railway station name. Obviously, I couldn't resist turning to my local stations first, but this is also a great book to dip in and out of. The mix of etymology, local history and station opening dates means you'll always learn new and random London facts - I found that a Civil War skirmish took place near New Cross in 1648, and that later a coaching tavern called the Golden Cross stood there; while Islington used to be Gislandune. See if you can answer the following questions: answers will appear here in the next day or two, or you can find them in the book! Which station is on the former estate of the Duke of Grafton, and named after his Suffolk home? Which station's name means 'the new manor house in the park'? Sloane Square was named in honour of which notable person? This station is named after a sports stadium built as part of the Franco-British Exhibition. Which underground station comes last alphabetically? This was one of the commonest medieval inn signs; there were 23 **** Alleys and 30 **** Courts in London in the mid-eighteenth century. The meaning of Earl's Court may seem obvious - but which earl? This station takes its name from a street, itself called after a town in Italy. Laundry - just twice a year! Many Breton towns and villages have at least one lavoir, or laundry-place. Pontrieux has fifty! These are public, outdoor spaces designed for doing laundry; the one pictured here is in the beautiful little town of Jugon les Lacs. In many parts of France the laundry was a weekly chore, but not in Brittany. Local women met here only twice a year in April and September. Pierre-Jakez Helias, in his wonderful account of a childhood in Brittany, describes the process: it lasted three days, which he nicknamed Purgatory, Hell and Heaven. First came the purgatory of piling up the washing in enormous wooden buckets covered with a coarse fabric, topped with ash. Boiling water was poured over, and the ashy water soaked the clothes (washing powder wasn't available). They were then left overnight. Then came the second day of hell: the women would beat the laundry from dawn until about 4pm without a break. Once it was put into clean water to rinse - some villages had a second, smaller lavoir for the purpose - the women would get to eat a late lunch. When the rinsing was done, one of the women had to get into the cold water to fish the clean garments out. They were spread onto neighbouring land to dry; the final, heavenly day, there was nothing to do except watch and turn the drying clothes. Given the infrequency of washing, it's no surprise that even Helias's impoverished father brought two dozen shirts with him when he got married! The ship is currently undergoing restoration, which has been complicated by a fire in May 2007. 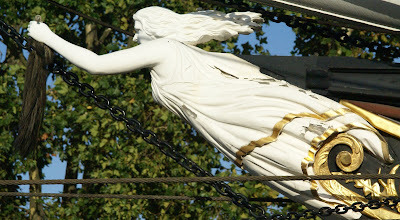 Happily, the figurehead was in storage at the time of the fire and survives unharmed. The ship's restoration is expected to be completed in 2010; meanwhile, the fundraising continues. You can donate here. Berlingots are sweet little pyramids from the ancient Breton capital, Nantes. Its position on the river Loire made it a centre for sugar imports in the nineteenth century, to the benefit of confectioners making these fruit-flavoured, hard-boiled bonbons. No one is quite sure who invented the berlingot, or even how it got its name. Was it introduced by Italians who brought berlingozzo caramels to the region, or did it come from the game of dice berleng, or even the bergot, a local lace headdress? How old is the actual recipe: mediaeval, eighteenth century, or from the 1830s? (There’s a detailed discussion in French here). Whatever their origins, these sweets are now sold throughout the city; you can even buy berlingot-shaped jewellery and souvenirs. Sweet memories! During the French revolution, many aristocrats lived under the shadow of the guillotine. However, one extraordinary woman saved not only herself but also her husband - by acting as his lawyer. Marie-Victoire de Lambilly was happily married to the Comte de la Villirouet. During the revolution, they were both arrested and Marie-Victoire was held in a former convent in Lamballe, Brittany. The conditions were awful, but Marie-Victoire wrote letters and appeals which secured first her own release and then that of her fellow-prisoners. However, her troubles were not over: her husband was imprisoned and faced the death sentence. Again, Marie-Victoire's response was practical. She took advantage of the fact that a revolutionary law abolishing all trade associations had effectively removed the traditional qualifications for lawyers: there was nothing, she argued, to stop her acting as her husband's advocate. Her argument was accepted, so she carefully studied and prepared for the trial. Marie-Victoire's court appearance was a success. It combined emotional appeal and legal argument. The Comte de la Villirouet was released; by contrast, all his co-defendants were executed. Having successfully won her first case as France's first woman advocate, however, Marie-Victoire did not pursue a legal career. She and her family continued to live happily in Lamballe, where she was buried after her death in 1813. This skull and crossbones sits on the gatepost of St Nicholas’ Church, Deptford. You can see why, according to legend, the “jolly roger” pirate flag was inspired by the church. One of my best beloved churchyards, I call the churchyard of Saint Ghastly Grim... It is a small small churchyard, with a ferocious, strong, spiked iron gate, like a jail. This gate is ornamented with skulls and cross-bones, largerthan the life, wrought in stone; but it likewise came into the mind of Saint Ghastly Grim, that to stick iron spikes a-top of the stone skulls, as thoughthey were impaled, would be a pleasant device. Therefore the skulls grin aloft horribly, thrust through and through with iron spears. The jolly roger may or may not have been copied from a Deptford churchyard, but it certainly was a design used by real pirates. The very first person known to fly a skull and crossbones was Emanuel Wynne, a French pirate who mainly operated in the Caribbean. His jolly roger was spotted in 1700. Other users included Edward England, an Irishman who worked on the African coast until his crew mutinied because he wasn’t bloodthirsty enough; Englishman Richard Worley who was captured in Jamestown harbour; and Henry Avery who mutineed against his captain and went on to take enough loot in one vicious journey to retire. When Peter the Great visited Deptford in 1698, he may have divided most of his time between learning shipbuilding and drunkenly wrecking his temporary home at Sayes Court. 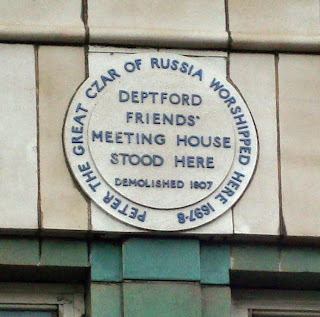 However, in quieter moments he also worshipped at the Friends' Meeting House in Deptford High Street. There, he discussed religion with William Penn. Penn was no ordinary Quaker, but the founder of Pennsylvania. He had converted thirty years earlier in Ireland and went on to face persecution for his faith. In 1670, he and William Mead were arrested for 'tumultuous assembly'. Famously, the jury acquitted them; the judge, disagreeing with their verdict, then imprisoned the jury! The King's Bench held that no jury can be punished for their verdict, thus establishing one of the fundamental principles of our legal system. Persecution of Quakers continued, and many died in prison; Penn himself was imprisoned several more times. Eventually, he asked King Charles II for land in America as payment for a loan made to the king by his late father. He was given Pennsylvania, which was named not for William but for his father. Penn became governor of the colony in 1682, although he spent most of the rest of his life in England. The Friends' Meeting House has not survived, and is now a Salvation Army charity shop. The czar's visit is commemmorated by a plaque high on its wall. Stephen and Virginia Courtauld somewhat controversially transformed the former royal palace into their dream home in 1936. They kept what remained of the original palace – basically the great hall Henry VIII played in as a boy, with its fabulous hammerbeam roof - adding stained glassand a decidedly inauthentic minstrel’s gallery. The attached new house, though, made few concessions to the site’s history: it combined Art Deco, ocean liner design, and the latest technology. Nonetheless, the overall effect is reasonably harmonious: neither building looks out of place next to the other.The entrance hall has a circular carpet mirroring the glassy dome in the ceiling, with marquetry panelling on the walls. There are ‘portholes’ in the stair walls, an effect mirrored in the built-in furnishings elsewhere. Ladies’ and men’s cloakrooms at the entrance are a reminder that the house was used a great deal for entertaining. Perhaps the most memorable room is Mrs Courtauld’s bathroom, designed as a temple to Venus: behind the bath is an alcove lined with gold mosaic tiles, housing a Classical statuette. Along with such en suite bathrooms, other modern amenities include a central vacuum cleaning system and a speaker system playing music throughout the ground floor (revolutionary at the time). Even their pet lemur's dedicated room had central heating! However, Mr Courtauld’s love of technology did not extend to the telephone. Guests were expected to use a pay phone just off the hall, not only because telephone calls were expensive but also because he personally disliked the instrument. This kind of personal feature emphasises just how much the house was one couple's vision of a perfect home, not just a fashionable showpiece. 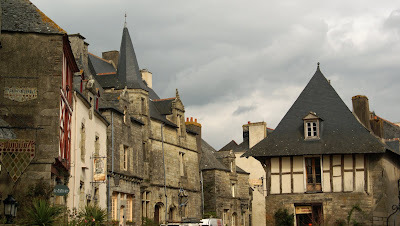 Rochefort-en-Terre is a 'little town of character' in Morbihan, Brittany, with houses and shops dating back to the sixteenth and seventeenth centuries and a mediaeval church. It's full of timber-framed and granite buildings, art and craft shops, and flowers. Even the town hall has an ancient wisteria clinging to its front. (Unfortunately, these photos were taken in winter so the plants are bare!). An important influence on the town's character was Alfred Klots. An American painter, he was among the artists attracted to the town in the early twentieth century. He took on the task of rebuilding the chateau, which had been destroyed during the Revolution. (Today it is in public ownership, and has a small museum). Klots also encouraged the townspeople to decorate their houses and balconies with flowers, establishing an annual competition for the best floral display. He even allowed local people to put delicate plants in his greenhouse for the winter; today, municipal greenhouses offer the same service. Rochefort-en-Terre remains famous for its floral displays and artistic activity. Craftspeople in the town include a bellows-maker, glass-blower, and candle and soap shops; not forgetting Breton biscuits and the buttery, flaky kouign amann ("butter cake"). However, you have to raise your eyes from the flora and facades to see one of the characteristic features of the town: its shop signs. They are carefully crafted to blend in with their historic surroundings, and add real character to the streets. 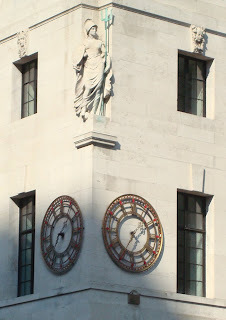 This statue of Britannia stands, appropriately enough, on Britannic House, Finsbury Circus. The building was designed by Sir Edward Lutyens and built in 1925 for the Anglo-Persian Oil Company, which we now know as BP. The British government had become a major shareholder in 1914, persuaded by Winston Churchill that Britain should have its own oil supply. Britannia was sculpted from Portland stone by Francis Derwent Wood, RA. He specialised in architectural sculpture, and had also produced the Machine Gun Corps Memorial at Hyde Park Corner. In a previous colloboration with Lutyens, he had carved the wreath on the Cenotaph. However perhaps the most extraordinary aspect of his career was his work producing metal masks for men who had suffered serious facial injuries in the First World War. When plastic surgery by the pioneering Harold Gillies was unable to help, such a mask could hide injuries and recreate missing features; it usually covered only part of the face. Officially the Masks for Facial Disfigurement Department, Wood's department in the 3rd London General Hospital became known as the 'Tin Noses Shop'. Wood's work also inspired another sculptor, Anna Coleman Scott, who opened a Studio for Portrait Masks in Paris. Mask-making was a laborious process: the person's face was cast in plaster of paris; a 'squeeze' was made of plasticine or clay; and missing features would be matched to the undamaged side of the face and pre-war photographs. The mask was then made of galvanised copper and carefully painted by an artist to match the patient's skin tones. The Project Facade website has silent film of the making and fitting of these face masks. The masks of course had no movement or expression; they cannot have been convincing. One wearer's children were frightened by his motionless face. Nonetheless, they changed lives: Ladd wrote that "the letters of gratitude from the soldiers and their families hurt, they are so grateful." Almost nothing is known of what happened to the wearers after the war. Now that summer seems about to disappear again, time to look back on a bank holiday weekend by the seaside. 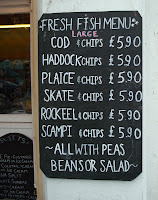 This sign in Cedars Road, Clapham is another favourite. I love the way that 'fashionable victorias and landaus' have been overwritten with 'cars bought and sold': a very visual demonstration of changing fashion! Other panels show offers of 'horses and carriages jobbed for any period' being overwritten with 'weddings - theatres - stations' and finally, 'cars for hire'. The technology has moved on from 'carriages rubber tyred' to 'welding, machining'. They may be faded and monochrome, but these signs bring to mind several generations of transport history. The grandparents, proud of their new-fangled victoria carriage (only introduced to Britain in 1869); the parents, who no longer keep a coachman but still like to travel to the theatre in a carriage drawn by a pair of greys; and the children, roaring around in their motor cars. Even the garage has gone now: the building has been converted into homes. 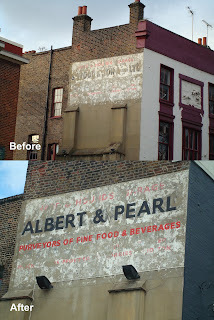 This sign is on the north wall of Spitalfields market. It left me wondering whether R Horner was incredibly modest, emphasising he only "finished rebuilding", or incredibly vain for commemorating himself at all. The market's history suggests a third answer: he was relieved. 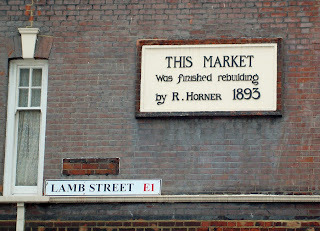 Robert Horner rose from being a market porter to buying the market in 1875. Rebuilding Spitalfields market was a major and contentious project, which cost £80,000 (roughly equivalent to about £8 million today). The plaque marks its end, after 18 years, in 1893. Horner eventually sold the market leasehold to the City of London in 1920. So Robert Horner didn't just "finish" the rebuilding; instead the sign appears to commemorate the end of a long and fraught project! Hardly anyone knows that a secret tunnel runs deep beneath the Atlantic Ocean. In May 2008, more than a century afte r it was begun, the tunnel has finally been completed. An extraordinary optical device called a Telectroscope has been installed at both ends which miraculously allows people to see right through the Earth from London to New York and vice versa. Okay, something tells me this might not really be done by a long, long tunnel and some mirrors. Nonetheless, you truly can see New Yorkers at the other end (by Brooklyn Bridge) in real time - there were some very excited people waving at friends when I was there - and it's a fun idea. See it in lots more detail on the website. This blog is just a place to share some photos, facts, links, whatever. Feel free to comment!